Are you craving some date packed bliss balls that are normally so problematic? 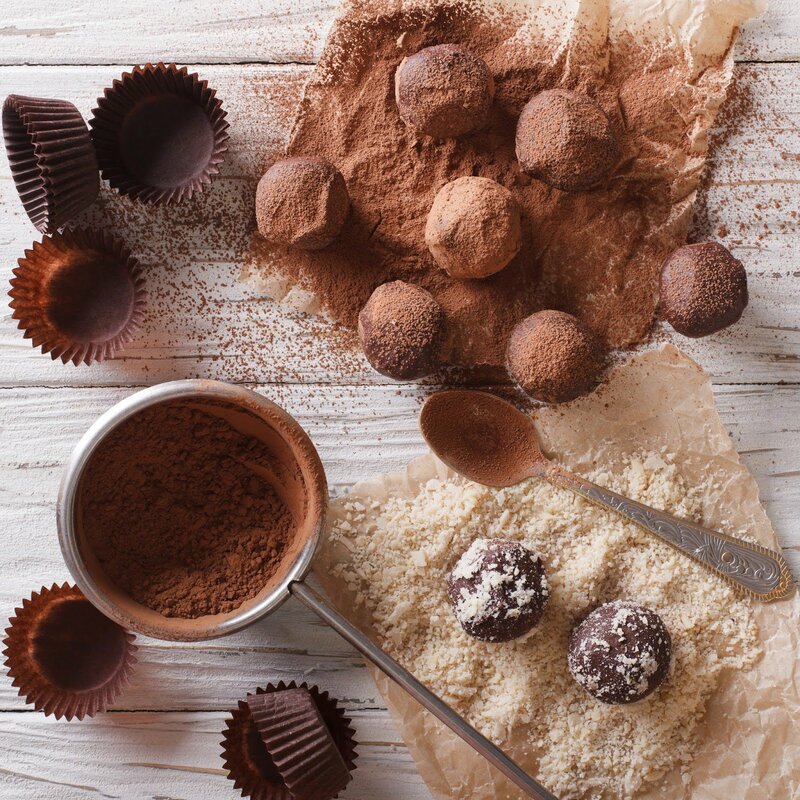 Well, the problem is solved, so now you can indulge in these delicious, chocolaty treats from time to time without having to worry about FODMAPs! Teff is a cereal with the healthy benefits of dietary fibre, calcium, iron and protein. Toasting teff gives it a delectable crunch and makes it a perfect coating for these easy to make balls. 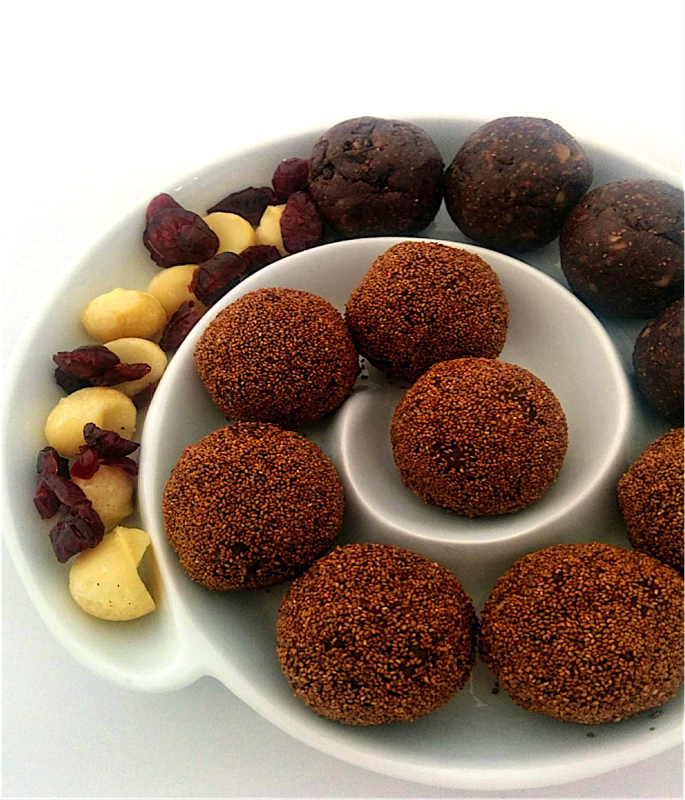 These bliss balls keep well and are great snacks at any time of the day, good in lunch-boxes, go really well with coffee and kids will love them too. Toast teff seeds in a frying pan over medium-low heat until they start to pop. Instantly remove from heat. Coarsely crush or chop macadamias. Blitz macadamias, cranberries, maple syrup, cacao, vanilla and salt in a food processor or Thermomix at high speed to produce a sticky crumb mixture. Be careful NOT to overmix. Remove mix from the processor and add the dark chocolate and just mix in to combine but maintain the chocolate pieces. Using slightly oiled hands, press and roll about half a desert spoon of mixture into balls. Coat balls (optional) in some toasted teff/chia/desiccated coconut/cacao powder and place on a tray lined with non-stick paper. *Teff flour has been tested and is low in FODMAPs (see our App). Given that the flour is made from whole seeds we suspect the whole seeds are also low in FODMAPs.